Not good enough and not bad enough. Bad movies in January are my comfort blanket. Every year I look forward to seeing some junk food films in January and February after the deluge of Oscar hopefuls and blockbusters from the holiday season. Every once in a while you’ll stumble across a hidden gem like Hansel & Gretel: Witch Hunters, but more often than not the movies are garbage especially in the horror genre. These movies are essential viewing because in order to appreciate the good you have to see the bad for yourself. Plus, it’s kind of nice going into a movie with rock-bottom expectations instead of expectations that are through the roof. The Forest is 2016’s debut entry, and sadly it’s just kind of forgettable despite having some redeeming qualities. The Forest harkens back to the mid-to-late 2000s, when J-Horror remakes were all the rage with movies like The Ring, The Grudge and One Missed Call. Your enjoyment of those types of movies will likely dictate your feelings toward The Forest. Personally, I enjoy these movies in a guilty pleasure type of way. I don’t know what it is about them. Probably the dread. Japanese-set or influenced horror is usually effective in setting up atmosphere even if they do nothing else right. It’s easy to make these films feel bleak and drained of life or hope. In this regard, The Forest is effective. Its failure falls on its reliance on jump scares, boring characterization and nonsensical plotting. The plot in brief: Sara (Natalie Dormer) searches for her identical twin sister who has gone missing in a Japanese forest known for being a common suicide site. All sorts of paranormal activities ensue as the forest is haunted by demons. 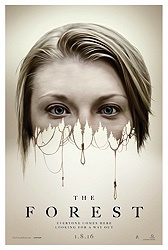 The performances in The Forest are fine but nothing extraordinary. This is not the type of movie that is a platform for acting prowess. Natalie Dormer gives it her all but she doesn’t (in my humble opinion) yet have the charisma to carry a movie. Her co-stars, including Taylor Kinney (as a fellow traveler that offers to take her into the forest), have very little to do so it’s up to Dormer to do all of the heavy lifting. This ties into my major gripe about The Forest, which is that we barely get to know Sara before her sister goes missing so we have no allotment as an audience to feel invested in her (or her sister’s) situation. It’s the type of movie where you sit and watch it passively, enjoying the technical craftsmanship, but never getting connecting emotionally or intellectually to the story being told. The movie was directed by Jason Zada and this is his feature film debut. He acquits himself nicely for the most part. He’s just working with a lousy, off-the-shelf script. As I mentioned earlier, The Forest succeeds in evoking an unsettling atmosphere. He makes the forest in The Forest (and Japan in general, for that matter) seem like a lonely and mournful place, “alive” with remorse and despair. I’m curious to see Zada’s next movie because if The Forest is a success there’s reason to believe he will have a better script to work with. I appreciate that the filmmakers are trying to dust off the cobwebs of the Americanized J-Horror subgenre, but The Forest is, at best, a middle-of-the-road example of it. It has a fair share of creepy imagery and it’s never boring but the plot developments often rob it of its momentum and suspense. The more the filmmakers explain what is going on, the less scary the movie gets. 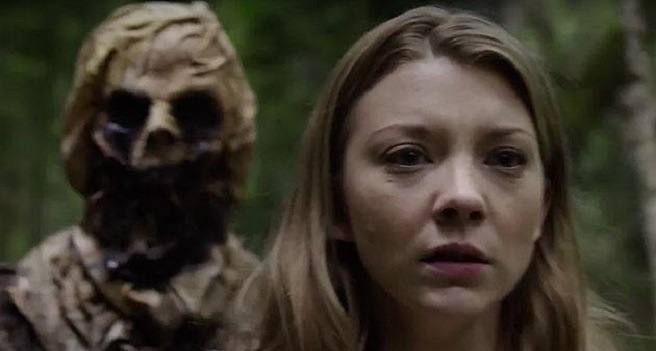 The Forest works best when it’s dealing in the abstract and not necessarily trying to move along in plot points. I wish it were more edgy and surprising and not so hopelessly generic. This is a movie about death and loneliness but there always feels like there’s an escape. I'd love to, but haven't seen it! More often than not, I find myself throwing out comments on long dead threads from 2013 reviews :( Thanks for the review, though. You have spiked my curiosity in Hansel and Gretel, which I had read somewhere was good, but everywhere else was bad. I'll check it out.